You know you need to slim down, but for one reason or another you’d rather not spend a lot of hours at the gym. Maybe you find it difficult to carve out time to drive there or there’s usually a long line for your favorite machines. Maybe you feel self-conscious because you think your stomach is too big or your muscles are too small. Exercise in the convenience of your home. Designing a home gym can be as simple as setting aside a corner for your floor mat and a few props. Check out what your local park has to offer. In addition to a jogging trail, you may find exercise circuits, a pool, and basketball courts. Walking is an effective and free form of exercise almost anyone can do. Plan your route around local shopping malls or waterfront promenades. Many studies confirm that changing your diet may be even more important than exercise when it comes to losing weight. While you need daily activity to stay healthy, you can shrink your waistline by consuming fewer calories. Make natural foods the mainstay of your diet. Replacing processed foods will eliminate most sources of sugar, salt, empty calories, and unhealthy fats. 2. Eat more vegetables and fruit. Aim for at least 7 servings a day of fresh or frozen vegetables and fruits. Eating a variety of colors will help you to consume a wide range of necessary nutrients. Most adults can eat just about anything in moderation. Plus, a sprinkling of M&Ms in your plain organic yogurt may banish cravings that could make you eat a whole bag. Chronic tension can cause inflammation, overeating, and other issues. Learn relaxation practices that work for you. You may enjoy listening to soft instrumental music or getting a weekly massage. Sleep deprivation triggers weight gain by slowing down your metabolism and interfering with the hormones that regulate hunger. Try to go to bed and rise on a consistent schedule, even on weekends and holidays. Studies show that adults who weigh themselves daily are significantly more successful at losing weight and keeping it off. Knowing you’ll have to face the scale tends to make you more conscious of your choices throughout the day. Keep in mind that daily fluctuations are natural and usually related to water weight. 4. Drink coffee or tea. Unless you’re sensitive to caffeine, you can probably safely consume up to 4 cups of coffee a day, according to most experts. While the effects are modest, caffeine can increase your metabolism and decrease your hunger. Many adults underestimate the number of liquid calories they consume. If possible, avoid soda and choose your cocktails wisely. For example, a Bloody Mary has 120 calories while a Margarita has 740. 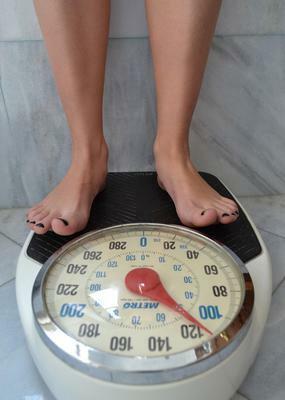 You can shed extra pounds and stay healthy without setting foot inside a gym. Exercise regularly, eat less, and make other positive changes that will keep your body lean and strong. If you are still looking for ways to lose weight on a healthy diet that you can enjoy, rather than feeling deprived, check out my book that I published for just that purpose!